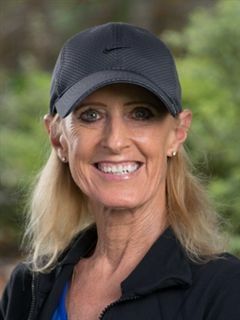 Christy Dillon writes about Patti Syvertson, Crystal’s Director of Sports Medicine and Chair of the Mind Body Program, in her regular column. Patti has made a significant impact on every Upper School student, whether she’s guiding them on health and fitness or helping them to heal. At age 12, Patti Syvertson was a competitive gymnast whose injuries were ignored by her coaches who knew little about the benefits of strength and conditioning. Frustrated by the ineffective treatment she was receiving, Patti decided to discover ways of both preventing and attending to athletic injuries. Her growing fascination with the mechanics of the body blossomed in college when, in that era, students majored in one of the three kinesiology strands: exercise physiology, sports medicine, or biomechanics. Patti decided to pursue degrees in all three, in large part because she intuitively understood that they were interconnected. Patti joined Crystal in 2001 as part of an EE Ford Foundation Grant to build a new and innovative Mind Body Program. Her initial stint was meant to last 3-5 years, but she ended up devoting the last 17 years to the program, which has been lauded nationally and adopted by other schools. The Mind Body Fitness Labs include an ever-evolving list of classes--reflecting best practices and relevant research--conceived by Patti and the Mind Body faculty. The vision for the program is grounded in the fact that for the mind to work efficiently, creatively and soundly, there must be a connection to the body. In other words, by attending to one’s physical well-being through proper exercise, hydration and nutrition, the brain operates on all cylinders. Moreover, students have fewer injuries because they understand how they occur and how to prevent them. Sounds simple enough, but according to Patti, modern life inhibits most of us from making this important connection. Whether we are tethered to our devices, don’t have time to exercise, or choose to ignore the science, Patti fears that our sedentary lifestyle will lead to more injury and disease. Because of these concerns, Patti continues to educate herself and especially our students to whom she is devoted. She is at the forefront of concussion protocol, helping students and families through the frightening and often daunting recovery process for which parents, athletes, and faculty sing her praises. A long-time meditator, Patti supported the introduction of mindfulness practices into the school. She initiated self-defense training for both boys and girls, CPR, and individual fitness plans to teach students how to take care of themselves post-Crystal. Patti ensures that students leave here with the knowledge of how their bodies work and how to work their bodies. Patti’s drill sergeant demeanor and “black is the new black” wardrobe belie the real Patti: a warm and empathetic beacon. While some students seek her assistance to put ice packs on sore shins, others come to unpack their problems, including school stress, bad break-ups, and life changing events. With Patti, students celebrate their successes and lean on her mighty shoulders for solace, comfort and wisdom. Faculty and staff seek Patti’s advice, too. When a podiatrist advised me to get an operation on my wonky toe, Patti spent two days manipulating it with her magic hands, and I haven’t had a problem since. Athletics are in Patti’s DNA. The daughter of a beloved football coach, and member of a sports-minded family, Patti looks back on her upbringing as being “raised in a locker room.” Early on, she fell in love with movement: “I loved what the body is capable of achieving. It is poetry in motion, and just being able to walk is amazing. I wanted to know more about it.” Just as important, Patti has an insatiable appetite for knowledge. Curious about almost everything, she believes in the power of education, and has logged in more graduate school hours than just about any teacher in the history of Crystal Springs Uplands School. Alums working in the medical profession thank her for teaching them material they encountered in college courses. Observing seniors working out in the fitness center brings a smile to Patti’s face. Ever indefatigable, Patti is constantly thinking about the student experience and changes to the Mind Body program, all in service of our students. Whether as a trusted teacher, motivator or this year’s senior class graduation speaker, Patti Syvertson is the heartbeat of Crystal.